Peterborough United caretaker-manager Dave Robertson is adamant he should be given the job on a full-time basis after masterminding a third straight League One win today (March 7). Posh beat Leyton Orient 1-0 at the ABAX Stadium thanks to Jon Taylor’s wind-assisted goal midway through the first-half. Robertson has a 100 per cent winning record since replacing Darren Ferguson and only goal difference and goals scored are keeping eighth-placed Posh out of the League One play-off places. Today’s win, which was achieved with 10 men for the final 10 minutes following Marcus Maddison’s controversial dismissal for serious foul play, gave Robertson enough confidence to deliver a bullish post-match press conference. Posh chairman Darragh MacAnthony was at today’s game and is planning to meet with Robertson and his staff on Monday (March 9) and Tuesday (March 10). Robertson is the first Posh manager to win his first three games in charge since Norman Rigby in the 1967-68 season. Rigby was a caretaker-manager who went on to get the job on a full-time basis. “I did speak with the chairman after the game, but not about the job,” Robertson revealed. “He is due to visit the football club on Monday and Tuesday next week when I expect he will sit down with me and my staff and discuss the future direction of the club. “The chairman is a great leader of this club, he is a great captain of the ship, but if I don’t get the job after three wins from three games I don’t think I ever will. “Hopefully he’ll be in a position to put the other 200 applications to one side and trust me my pen will be ready to sign whatever he offers! “It’s been a great start for me and a great week for the players. To collect nine points from three very tough opponents is a fantastic effort and Leyton Orient may well have been the toughest opponents of the three (after play-off chasing Sheffield United and Bradford City). “Orient are in a relegation battle, but they have good players, strong players and experienced players. We played well again though in the first-half and we showed great resilience and strength of character after we’d gone down to 10 men. 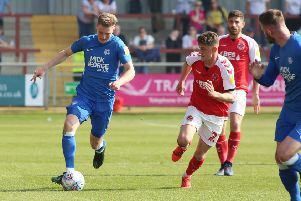 Posh will review Maddison’s red card before deciding on Monday whether or not to appeal a decision that will carry a three-match suspension for serious foul play. Maddison had replaced Joe Newell at half-time after the latter picked up a back injury. Taylor’s withdrawal 20 minutes from time was precautionary. “I felt the referee had a good game,” Robertson added. “And I won’t make statements that are based on emotion. On first viewing the tackle by Marcus looked strong, but fair so we will have a look at it on Monday before deciding whether or not to appeal. “Maybe the referee felt that Marcus had gone in strongly because the same player, who already had a yellow card, had just ‘done’ Marcus in the corner with a nasty tackle, but as far as I could see that was the only mistake the referee had made all game. Posh now have two tough away games at Doncaster (March 14) and Preston (March 17). They reached 50 points today which is usually enough to guarantee against relegation!